On Saturday 27 May the Association de botanique et de mycologie de Sainte Maure de Touraine had an outing to check out the orchids around Chaumussay. Pyramidal Orchid Anacamptis pyramidalis (Fr. 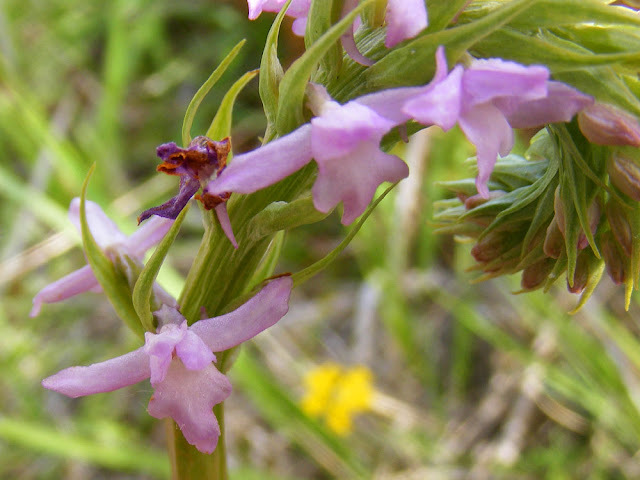 Orchis pyramidal). 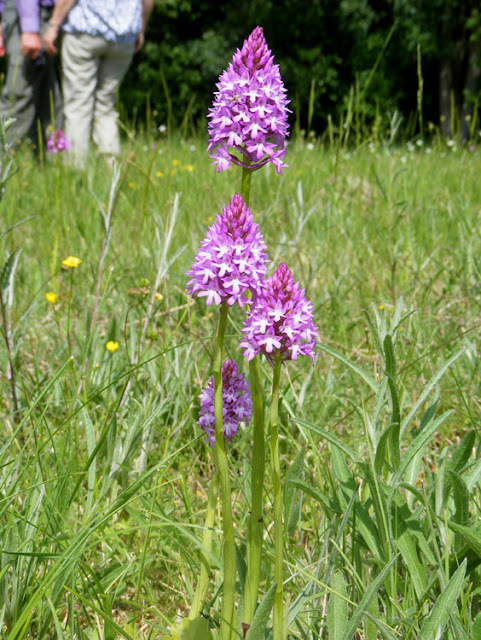 There were dozens of Pyramidal Orchids in a field near Humeau. This was a site I was completely unaware of, despite it being opposite another excellent orchid site with different species. This bramble stem gall is old and its occupants long gone, exiting through all the little holes you can see. 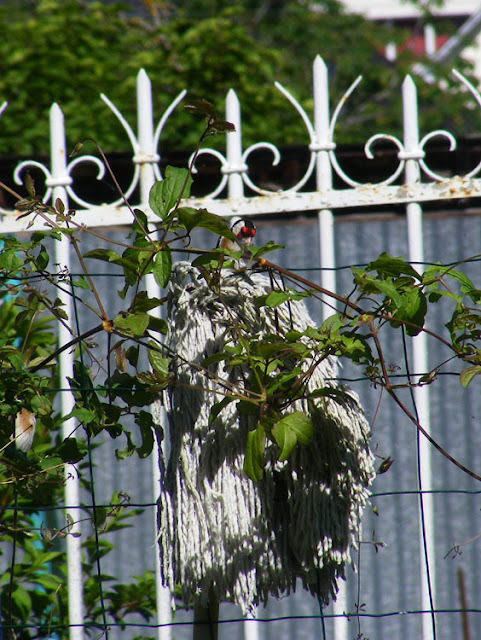 The gall is caused by a tiny wasp called Diastrophus rubi. They lay their eggs in tender young bramble stems that are low to the ground. 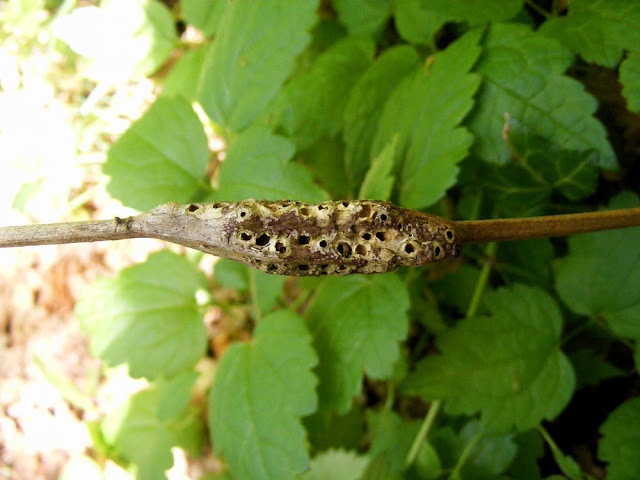 The plant creates a 'scab' or gall that the wasp larvae live in until they emerge. Red Helleborine Cephalanthera rubra (Fr. Cephalanthère rouge). 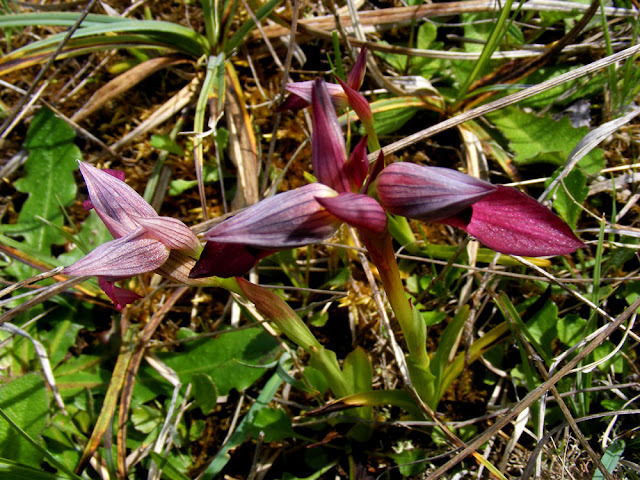 Marc and Jean asked after the team at Kew who came last year to research the Red Helleborines. Cervaria rivini (Fr. Herbe aux cerfs). You may not be very impressed by this plant, but I was, and Jean called me over especially to make sure I saw it. He knew I would be interested. It is related to carrots and parsley, in the Apiaceae family and grows to about a metre high, bearing pink and white umbles of flowers in August. I'll have to go back and photograph them. It is a plant of dry limestone slopes. We are on the north-western edge of its range here. It's really a species of central and southern Europe. Black Pea Lathyrus niger (Fr. Gesse noircissante). This plant has a somewhat special status amongst local botanists. 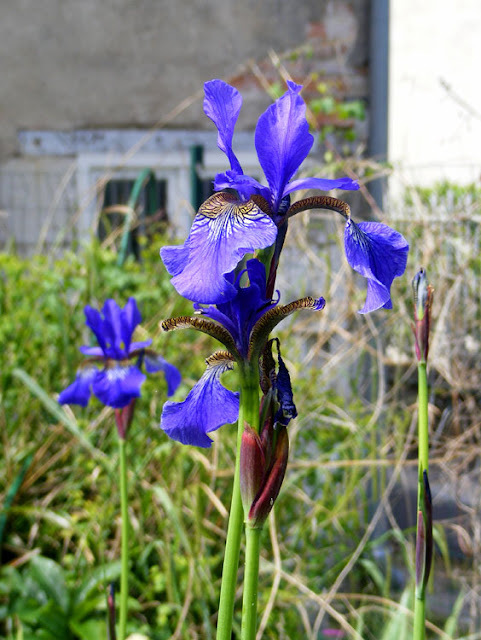 It's not very common, but this one was photographed in the very spot that 19C Preuilly based botanist Moïse Aristobile collected it for the important French herbarium that is now lovingly cared for by François Rabelais University in Tours. 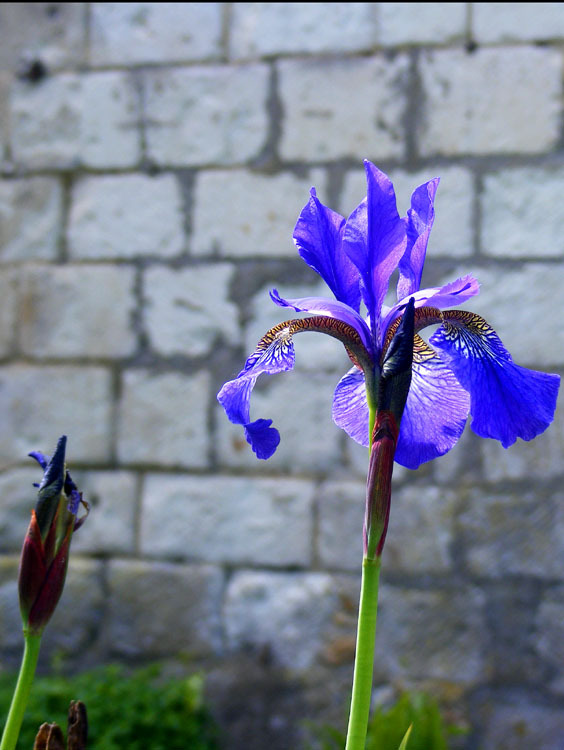 The flowers are pollinated by bees, starting out red but turn blue to tell the bees that they've done their job. Common Fragrant Orchid Gymnadenia conopsea (Fr. Orchis moucheron). Many of the sites around Chaumussay that have Fragrant Orchids have two or even three species. Marc refreshed all our memories on the intricacies of how one tells them apart. 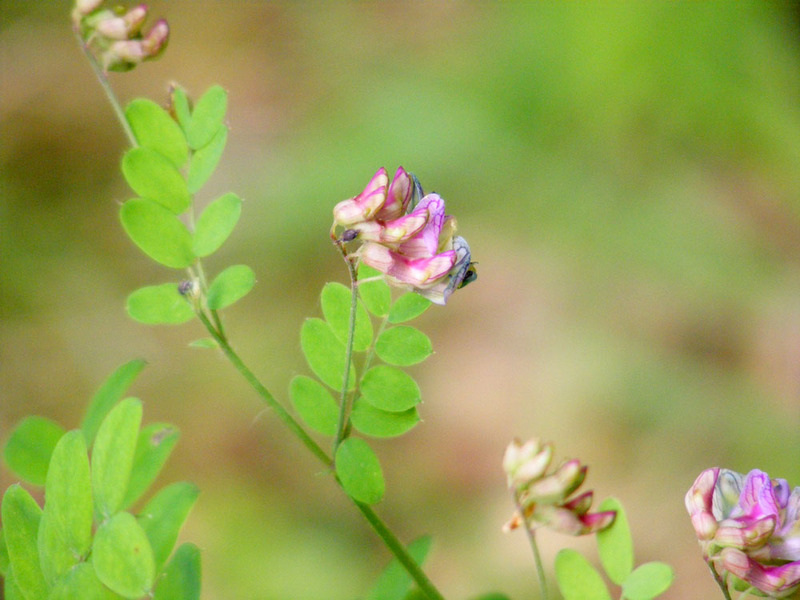 The Commons have long spurs, fairly evenly lobed labellums and sepals that sit slightly under the horizontal. Short-spurred Fragrant Orchid G. odoratissima (Fr. 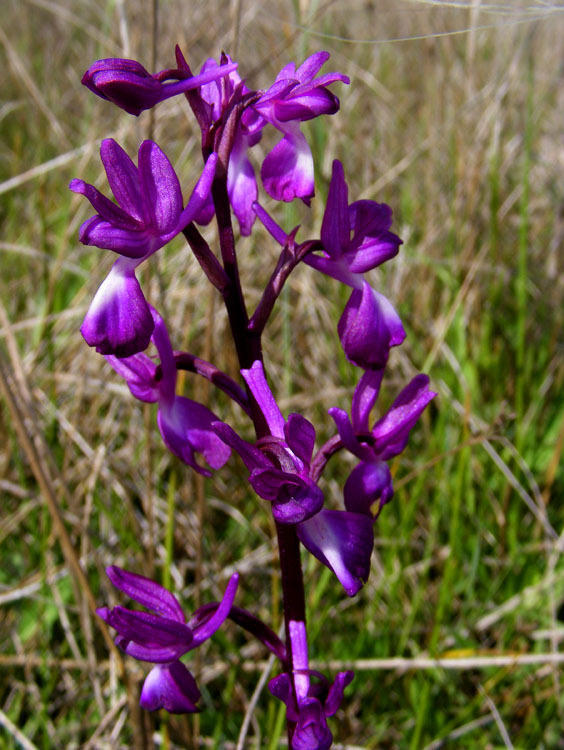 Orchis très odorant). 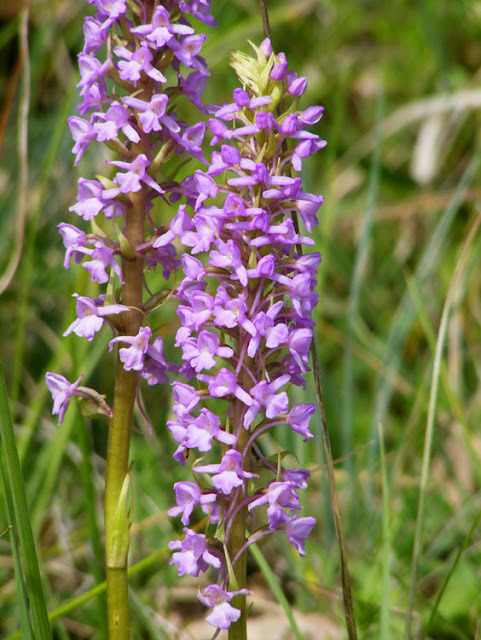 This photo clearly shows the horizontal sepals and the long central lobe of the labellum of the Short-spurred Fragrant Orchid. It was growing right beside a Common Fragrant Orchid and no doubt the little blighters were hybridising just to add to the difficulty of identifying them. 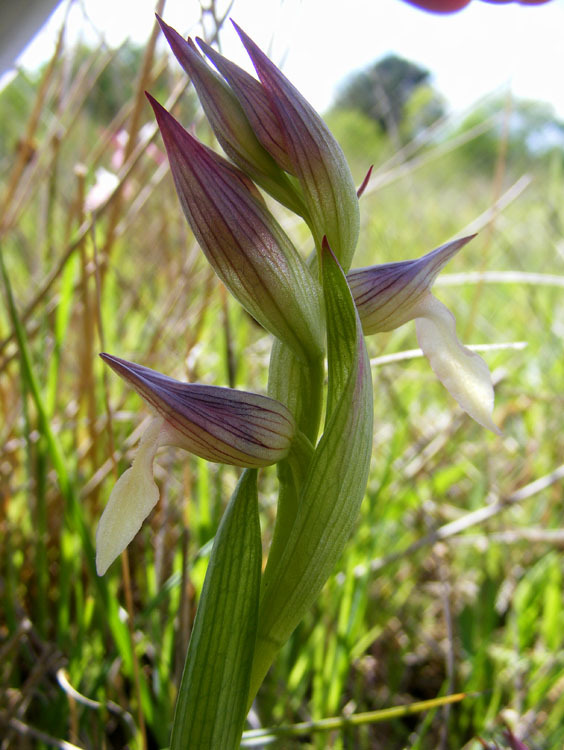 slopes are home to many orchids. My friend Nicole, from Les Limornières, took this photo. It's a field by her house near Le Grand Pressigny. 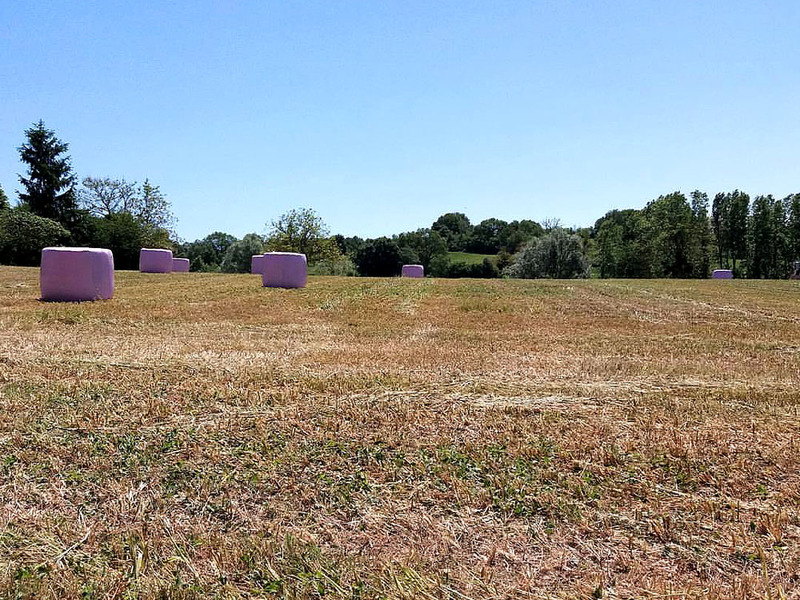 The farmer has been making hay, and to her surprise it was wrapped in pink plastic. She thought that was fairly uncharacteristic behaviour for the farmer, but we suspect it might be part of a campaign that the manufacturers of the plastic wrap are supporting to raise awareness of breast cancer and raise money for research. From what I've read, part of the proceeds of the sale of this pink wrap goes to cancer research. Roughly 50% of people working in agriculture are women, so it is perhaps not so surprising that the sector may wish to support breast cancer research. 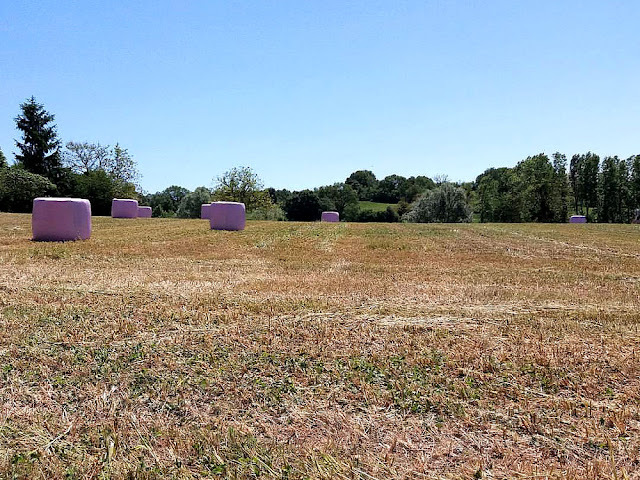 Apparently in France, for each roll of pink plastic bought, the farmer pledges to pay €2 to the Ligue Contre Cancer du Sein (the League Against Breast Cancer). Last year farmers raised €15 000 in this way. After the hay is used the plastic is recovered and recycled. My researches on the internet have revealed at least four manufacturers of the plastic wrap who are involved in the project. Genius I reckon! The Belgians do not have a reputation amongst people of other nations as being fun loving, exuberant, and eccentric. 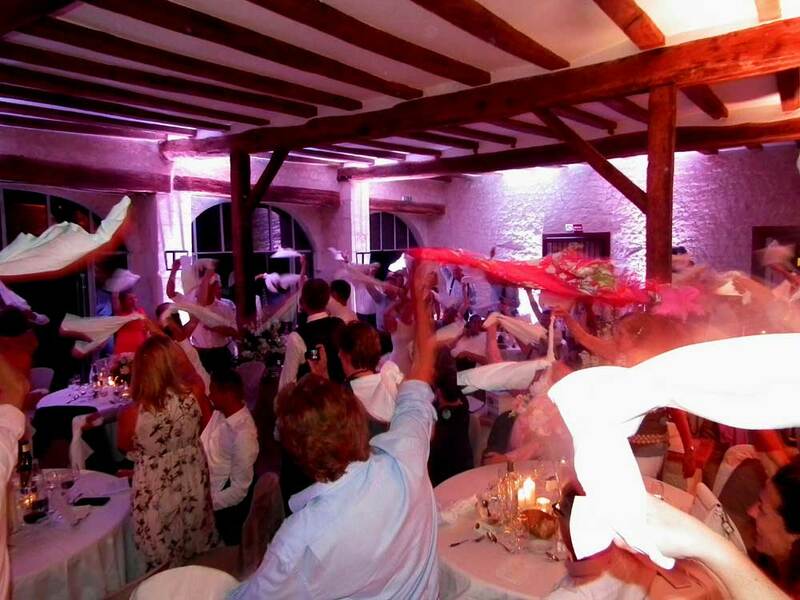 These are people who have evidently not been to a Belgian wedding. You can just about see the bride (Caroline) in the middle of this photo. 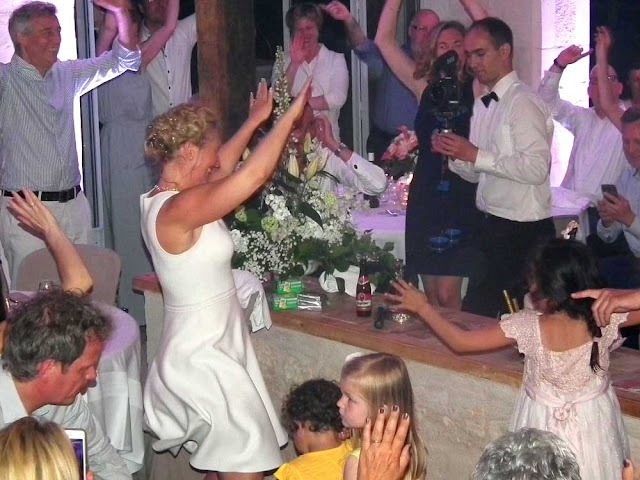 The music starts, people pick up their serviettes (napkins) or their scarves - or even their neighbour's scarf - and proceed to act in a most undignified manner - as shown in this random youTube video taken at someone else's wedding. (I didn't do video - I was jumping about waving my napkin like a loony. Who wouldn't?). I assume that the napkin waving is a tradition older than the song many people use, and that the actions started on the football (soccer) terraces. I don't care though. It's slightly weird, easy to join in on (even if you have no idea why). We were told it's a Belgian tradition, and that's good enough for me! The Lakes of Connemara is a song by Michel Sardou written in 1981 with lyrics by by Pierre Delanoë and Michel Sardou, and music by Jacques Revaux. Having suffered from the heat following a long journey, Jacques Revaux's synthesizer gave a sound close to a bagpipe, which gave Michel Sardou the idea to write a Scottish song. Since neither he nor Pierre Delanoë knew Scotland, Delanoë went to look for documentation but came back with a tourist brochure about Ireland. The lyrics are inspired by John Ford's movie "The Quiet Man". 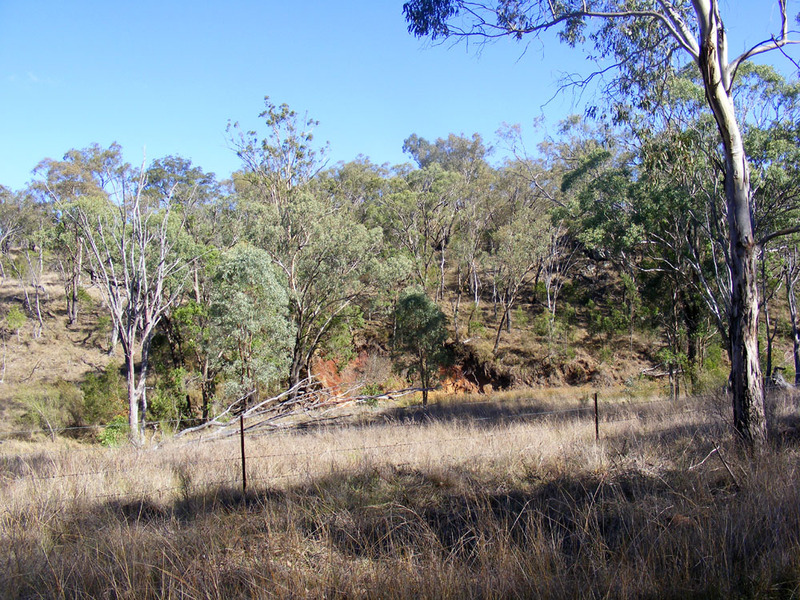 A wooded ridge in south-east Queensland, native vegetation typical of these rises, which are not suitable for ploughing. The dominant tree is a species of eucalypt known as ironbark. 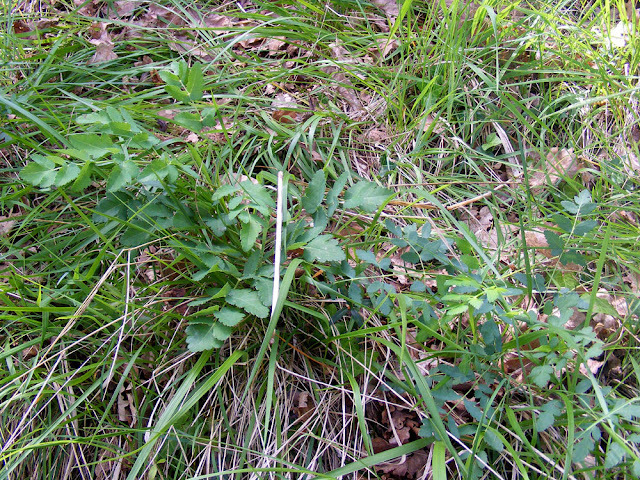 There are many equivalent wooded ridges in the Touraine, dominated by Downy Oak. The other day I got an email from my friend Christine. She asked me if I'd encountered a South African couple called Jheanne and Joy in the street in Preuilly. She told me they had borrowed a house at the top of our street and were here for three months, with no car and no French. So at Christine's suggestion I made contact with them. 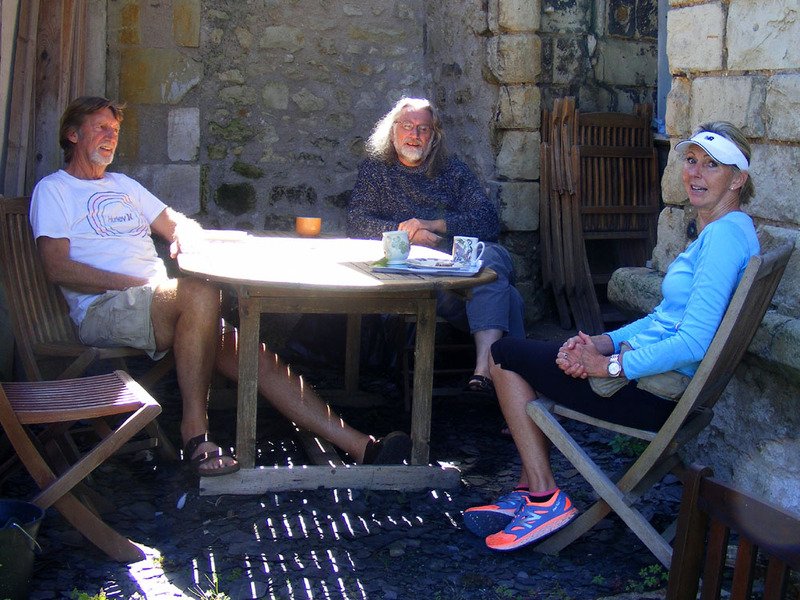 A few days later they were passing and we were in the garden, so they stopped for a chat and a cup of tea. As Christine says, they are très sympa. They aren't the only stray travellers we've been directed to recently. On 8 May at the ceremony for Victory in Europe Day there was a couple attending, standing diffidently at the back of the group around the War Memorial. I didn't recognise them, and neither did Gérard, the deputy mayor. He went over to introduce himself and discovered they were Australians called Christine and Geoff, travelling around France, who had seen the ceremony as they passed by chance and stopped. Christine spoke some French and was very interested in the World War II history of the area, especially the Resistance. She had been reading Robert Gildea's Fighters in the Shadows, and her own father had been in the Special Forces in Borneo. Gérard made sure we were introduced and we joined them for the vin d'honneur and talked about the war. At the moment we have an old fashioned string mop wedged into our fence. 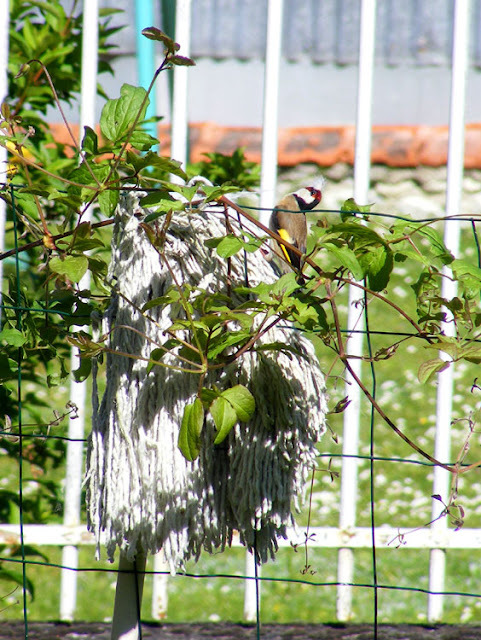 It was put there to dry, but now we can't remove it because we have noticed that a pair of Gold Finch Carduelis carduelis (Fr. 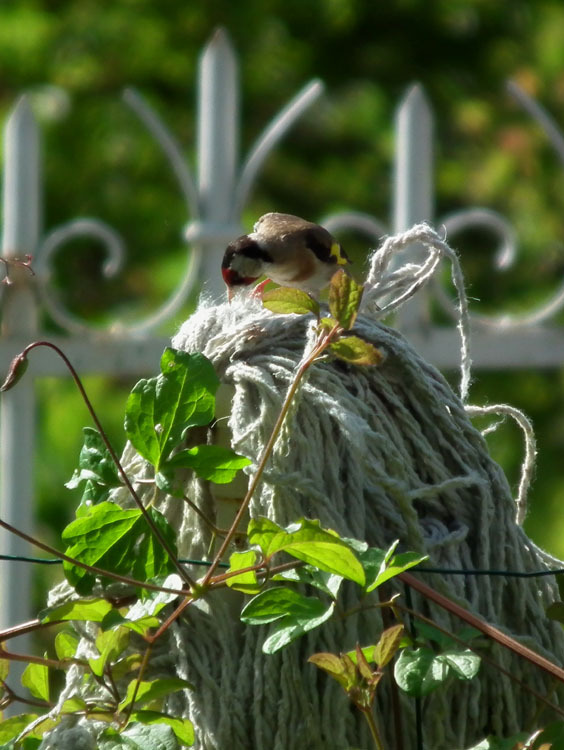 Chardonneret élégant) are stealing fibres from it. 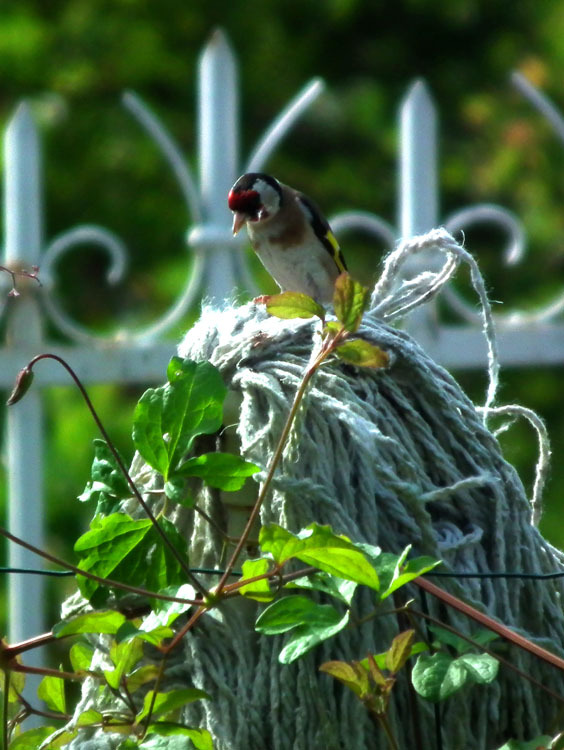 The couple must be building their nest in a neighbour's garden. As you can see in the first two photos, only the female collects nesting material. 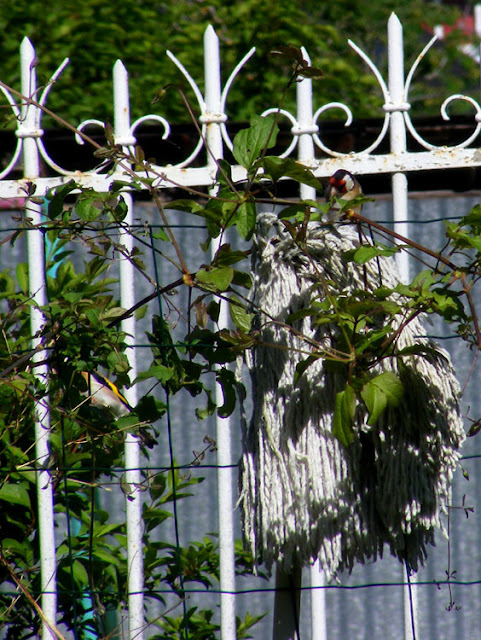 The male perches nearby in the clematis keeping guard. He isn't protecting her from predators, but from other male Gold Finches who may attempt to mate with her. According to Tim at Aigronne Valley Wildlife, he probably has several females in a sort of harem. 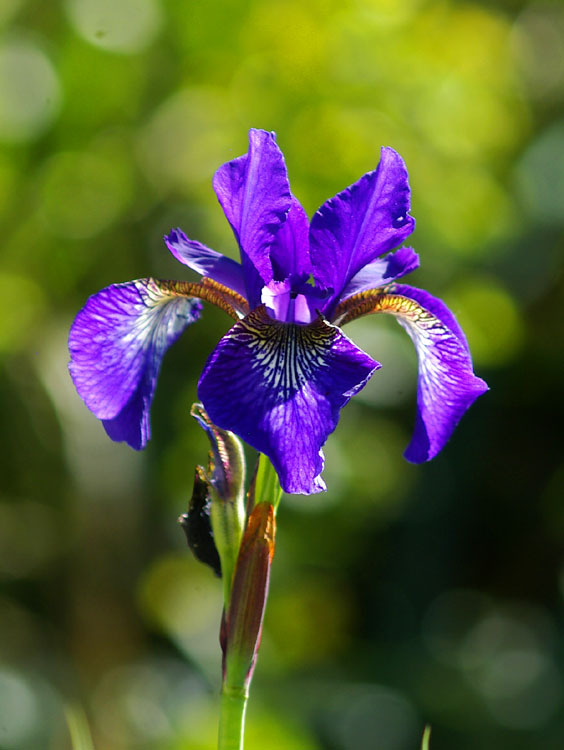 Unfortunately our Siberian Iris, Steve, didn't make it through the winter. I don't know what the problem was. He'd been transplanted into a nice new blue ceramic pot that matched his petals beautifully, but obviously he just wasn't happy. 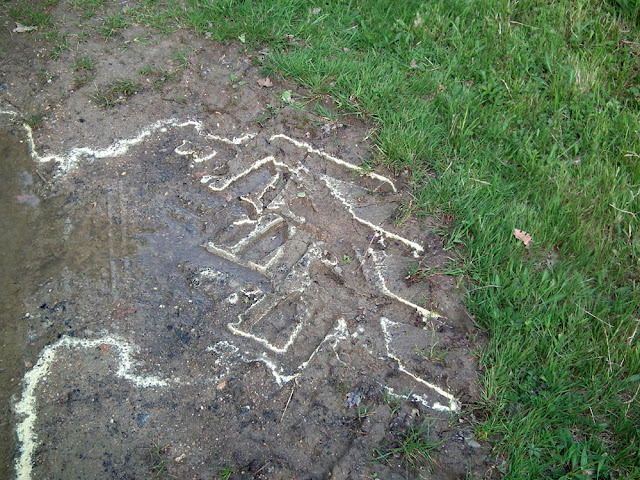 I suspect it was lack of water, and therefore our fault. A Pseudo-Steve Siberian Iris in the back garden. So it's up to the Pseuds out the back to keep the flags flying. Which they are doing admirably at the moment. The above photos were taken on 22 May by me with my old Fuji. The photo below was taken yesterday by Simon with the Pentax that Tim gave us. 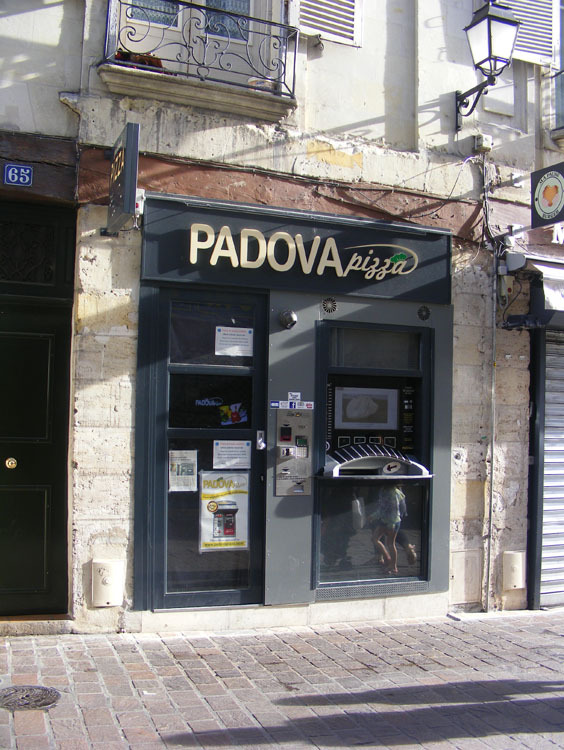 This place, in rue du Commerce in Tours, used to be a perfectly ordinary pizza takeaway restaurant. Now it is a vending machine. What is the world (or at least central France) coming to? I didn't look at it closely to see exactly how it works. Can one buy a pizza at any hour of the day or night I wonder? Rue du Commerce is in Vieux-Tours (ie the old medieval heart of the city of Tours, with lots of surviving medieval buildings). The residents include lots of students and it is where many tourists choose to stay. I imagine this pizza machine is probably well used and the owners are congratulating themselves on a smart business decision. I'm still dubious about the idea though, and not just on aesthetic grounds. 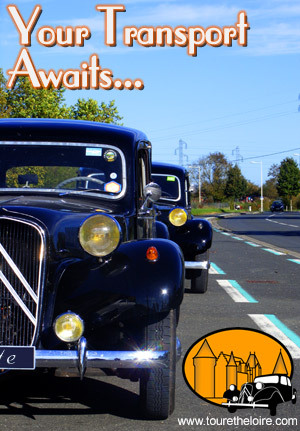 Simon has been busy, redesigning the website for Loire Valley Time Travel. He started at 9am on Sunday and with the exception of going to a picnic on Sunday afternoon worked through until 11pm on Monday, at which time it was "just about there". Yesterday he slept until lunchtime, and then spent 10 hours testing to make sure it did what it was supposed to do, and (hopefully) correcting all the typos. Then he sent it live and spent another 3 hours testing it still worked in the wild. The website is here: www.tourtheloire.com and theoretically will work properly no matter what computer or device you are using. It's called responsive design, and until Sunday he knew what the concept was - nothing more. He says if it doesn't work properly for you he would like to know, but that it might make him vewwy cwoss with technology. 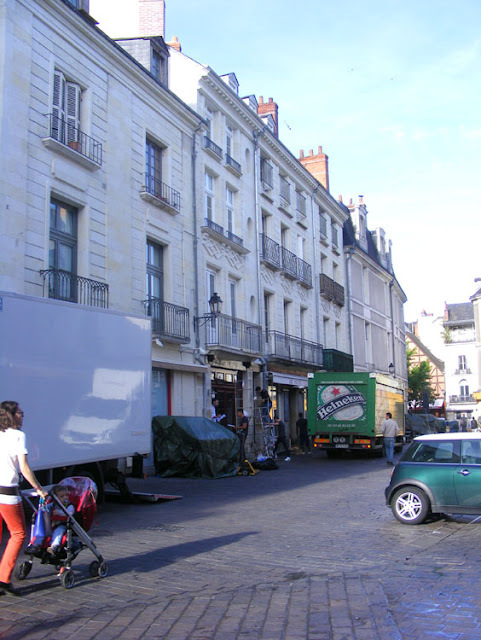 Twice we have witnessed the immediate aftermath of a fire in an apartment in rue du Commerce in Tours. A fire hose snakes down rue du Commerce in 2015, and a hydraulic platform is still visible opposite the burnt apartment at the end of the street. The blue fronted building on the right is the bookshop whose apartment burnt in 2017. 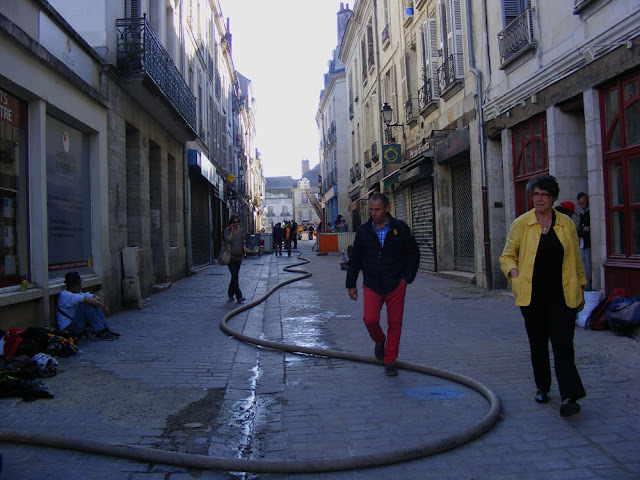 Back in May 2015, when my uncle Ric and his wife Sheila were visiting, we encountered the fire brigade just packing up after a fire in a building near the intersection of rue de la Lamproie. 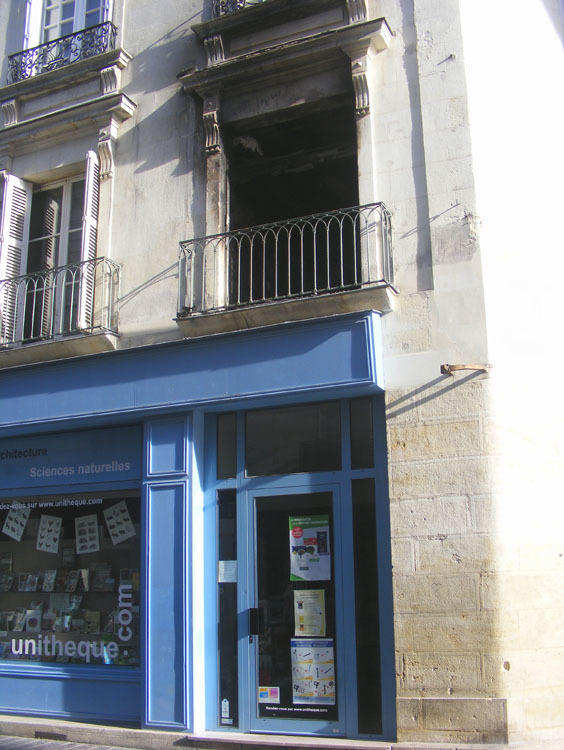 Then two years later almost to the day, we walked by to see the scorched windows of the first floor apartment above the science bookshop on the corner of rue Paul-Louis Courier being inspected by three men who may have been the insurance assessor and two tradesmen. But back up at the rue de la Lamproie end of the street, the painters were working on the property next door to the one that burnt in 2015, adding the finishing touches to a very nice restoration. The burnt out property has also clearly been restored. Burnt out apartment over the bookshop in rue du Commerce. The 2015 fire was in an apartment and caused a gas bottle to explode. It happened at 6.15pm in the evening and three fire stations responded with two fire trucks and 30 firemen. The two level apartment on the first floor was completely destroyed but no one was hurt. A fireman was treated for shock after the gas bottle exploded. The fire was probably started accidentally. The apartment which burnt in 2015 is in the building behind the object under a green tarpaulin. The more recent bookshop apartment fire was reported at 3pm on a Saturday afternoon. Rue du Commerce comes off Place Plumereau, the old centre of Tours, and the street was crowded. It took two fire trucks, 20 or so firemen and a dozen emergency services vehicles to deal with the fire. Two people, a 5 year old boy and his 69 year old grandmother, were taken to hospital with smoke inhalation. The fire started in the kitchen and the grandmother had been preparing something for her grandson to eat. The apartment was completely destroyed. Two of the occupants were out at the time of the fire, and all four have had to be rehoused. Two went to family, two were put up in a hotel by their insurer. The street was closed for two hours, so the shops along rue du Commerce no doubt lost some business. The whole building was evacuated while the fire was burning, but the neighbouring apartments were untouched. The bookshop below suffered water damage when a pipe burst. Once again we've been shown something different on our last visit to the mushroom caves at Bourré. 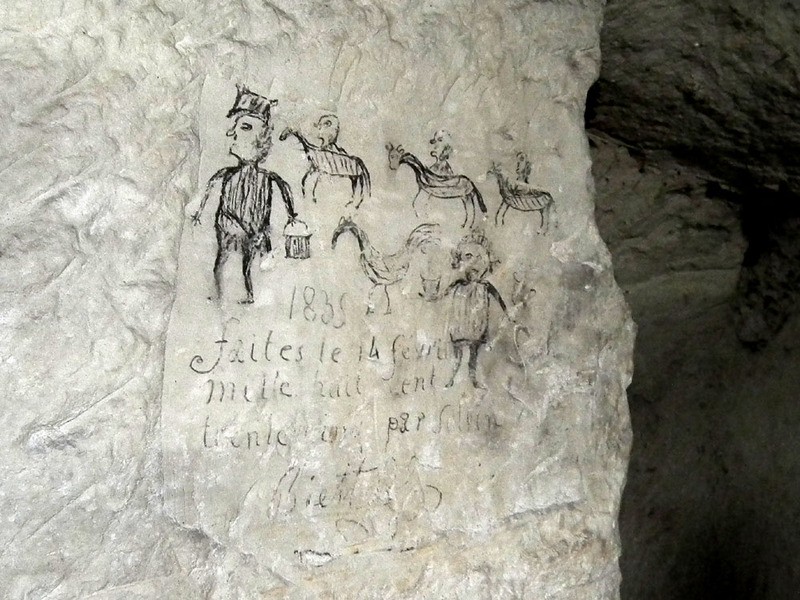 Above is some graffiti showing a man with a bucket, three horses and riders, a rooster and another man holding two vessels. The text translates as '1835 done 14 February one thousand eight hundred thirty five by Julien(?) Biett(elle?)'. 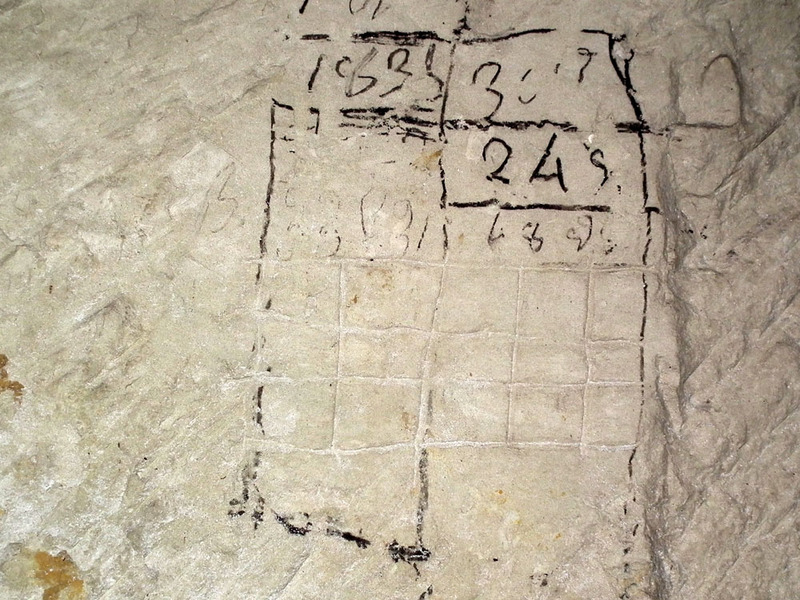 The photo below shows a grid with numbers. The guide told us it was a tally of mushrooms (presumably harvested). One of reasons I finally signed up for Facebook last December is because there are a number of very active entomology groups that use this medium. Within 24 hours of me having an account my friend Chris, a parasite fly expert who works at the London Museum of Natural History, had signed me up for about a dozen of the groups he thought I would find most useful. It was all a bit of a whirlwind and I was amazed at how much was being posted and by whom. Just recently, Erica McAlister, the fabulous Curator of Diptera at the London Museum of Natural History announced on the British Soldier Flies and Their Allies group that 30 March was World Robber Fly Day. 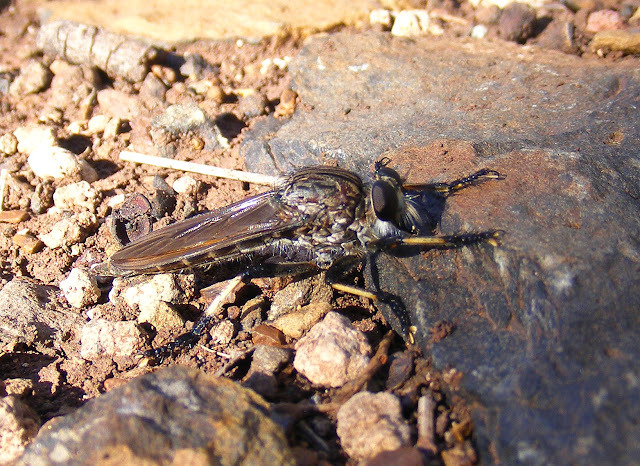 She asked that as many people as possible contribute a picture of a Robber Fly. So I chose this nice example from January 2014, photographed on a farm track very early in the morning, near my home town in south-east Queensland. We don't know what the species is, but it looks like one in the Asilinae sub-family. Like Erica I'm a big fan of Robber Flies Asilidae. They are ferociously efficient hunters with a far higher success rate than vertebrate predators. This year many local vineyards have been hit by frost. Some have resorted to laboriously laying out and lighting dozens of frost candles in the vineyards every night when frost was predicted. Others have really gone to extreme lengths and hired helicopters to hover over the vines in the early morning. I think the solution might be simpler, although it might need some experimentation to establish the most reliable method. The question is does the winemaker buy several sets and drape them around the vineyards at risk, or is just wearing them discreetly sufficient? Do other brands work or only this one? In case you are wondering what I'm on about, Antigel is a line of underwear and swimwear by Lise Charmel. Antigel means 'anti-freeze'. 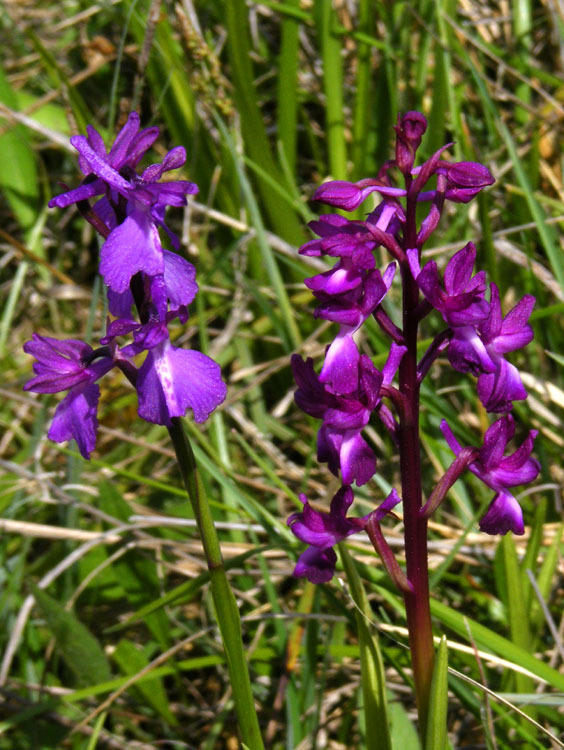 On the left, a hybrid Green-winged x Loose-flowered Orchid (Anacamptis morio x A. laxiflora); on the right, a Loose-flowered Orchid. Loose-flowered Orchid Anacamptis laxiflora (Fr. Orchis à fleurs lâches). Two of five photographers all pointing at the same thing. 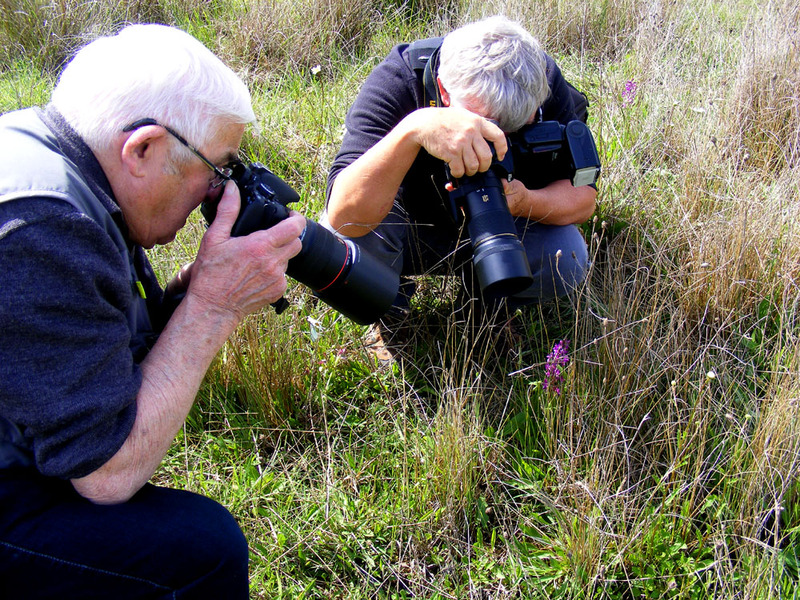 They are not photographing the orchid, but a large bright green crab spider in the grass. 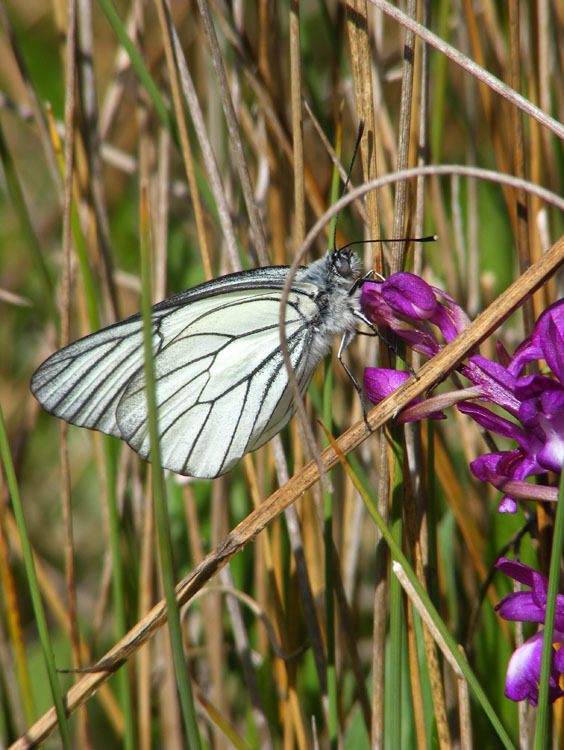 Black-veined White Aporia crataegi (Fr. Gazé) resting on Loose-flowered Orchid. Loose-flowered Orchids in the grass, with members of the botany club. 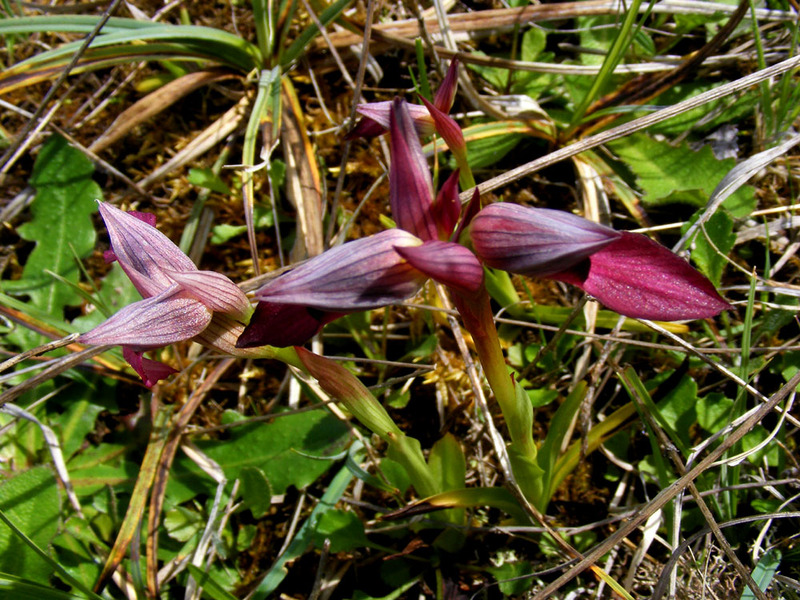 A typical looking Tongue Orchid Serapias lingua (Fr. Sérapias à languette). A Tongue Orchid with a yellow labellum (the bottom petal or the 'tongue'). The lack of red pigment is a mutation. Marc has asked me if I will return to the site in the late summer/early autumn to survey the Autumn Lady's Tresses Spiranthes spiralis, and I will be very pleased to do so. 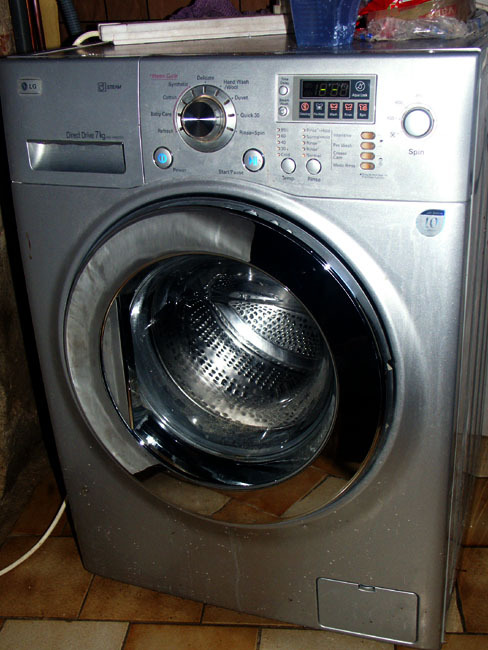 Susan mentioned (about a 10 days ago) that our washing machine wasn't working. First it showed the child lock was on, then it showed the thermostat was faulty. After unplugging and plugging it in again both warnings disappeared, but the main control wheel didn't change anything when turned. Research on the internet told me how to sort out the thermostat, but it was fairly obvious that wasn't actually the problem. I was reluctant to drag the washing machine into the middle of the kitchen floor and dismantle it, only to find I couldn't fix it. Meanwhile, we took up the kind offers of various blog readers to do some washing whilst I pondered our next move. All the while the machine sat in the laundry, unplugged, until Tuesday afternoon, when I plugged it in, pressed the button - and it worked. So I can update my status to "baffled, but relieved". 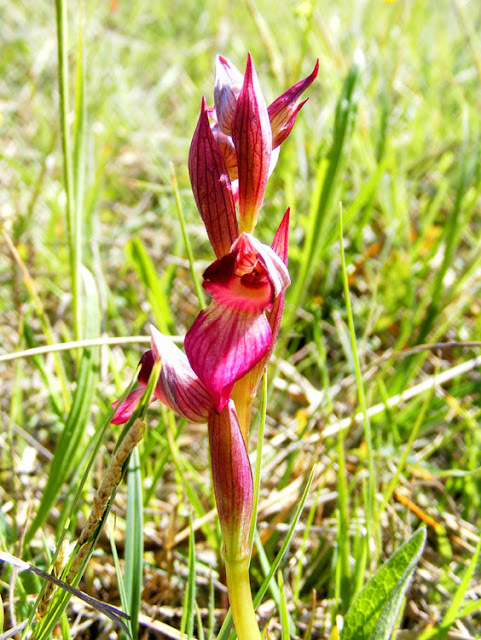 On Sunday 14 May Marc Fleury led a botany outing to see the last remaining colony of Tongue Orchid Serapias lingua (Fr. Sérapias à languette) in Indre et Loire. The site is hidden away, well off the main road, and was once used as a source of kaolin for porcelin making. 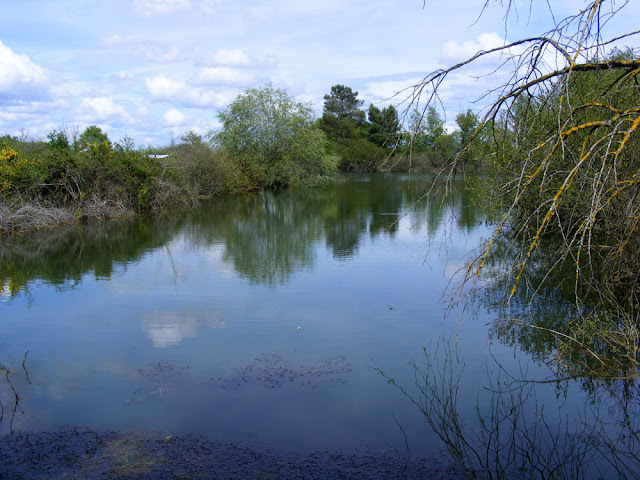 It is wet in the winter and dry in the summer, covered in rough grassy open areas and patches of scrub. 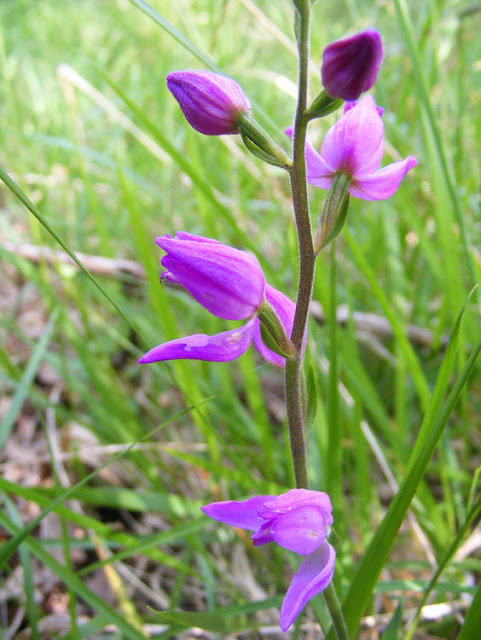 Perfect for not just Tongue Orchids, but Loose-flowered Orchid Anacamptis laxiflora (Fr. Orchis à fleurs lâches) and Green-winged Orchid Anacamptis morio (Fr. Orchis bouffon). Apparently there are Autumn Lady's-tresses Spiranthes spiralis (Fr. Spiranthe d'automne) too, later in the season. Tongue Orchids don't stand out much, being pale in colour and no higher than the grass they are growing through. It is an extensive colony of Tongue Orchids, with hundreds of plants over, I would guess, about a hectare. 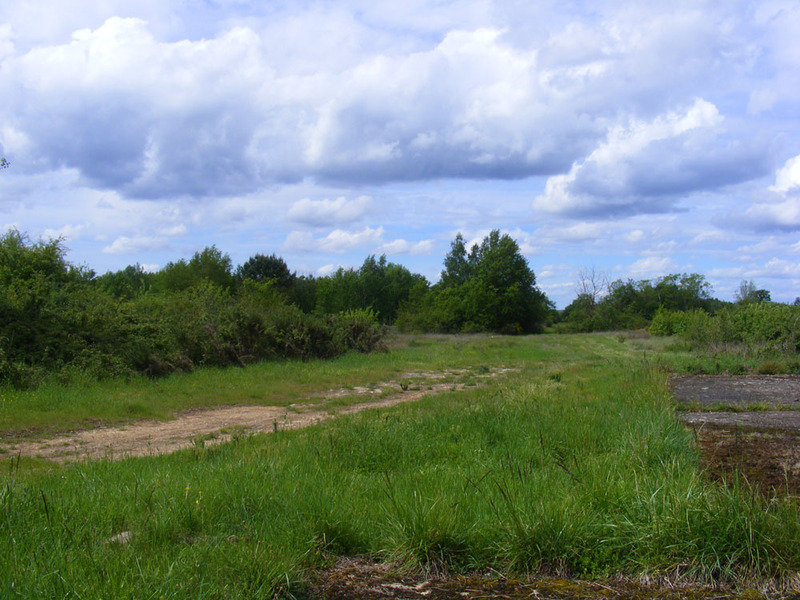 It's quite difficult to avoid standing on a few plants, and the tracks through the site were quite boggy. 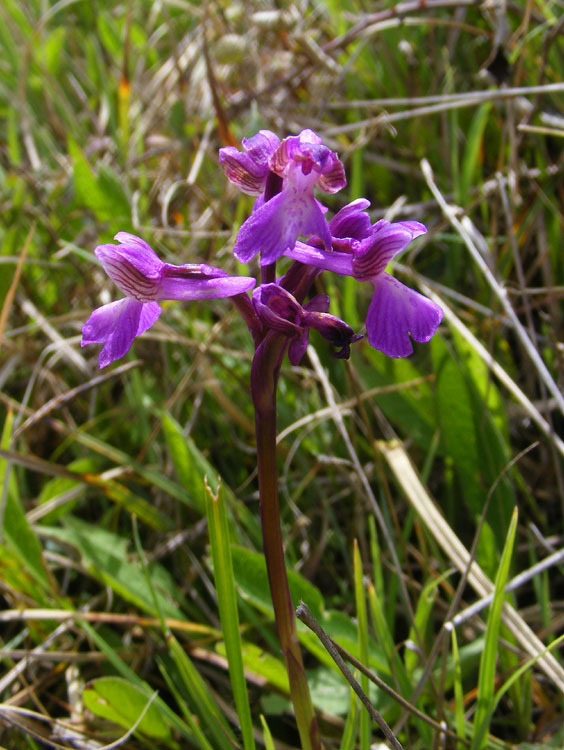 Green-winged Orchid, so named because the distinctive stripes on the lateral sepals are sometimes green. Tongue Orchids are one of the few orchid species that produces more than one bulb each year, so you often get multiple flower spikes very close together. They have evolved to have a large 'tongue' or labellum as their bottom petal. This serves as a landing pad for insects. 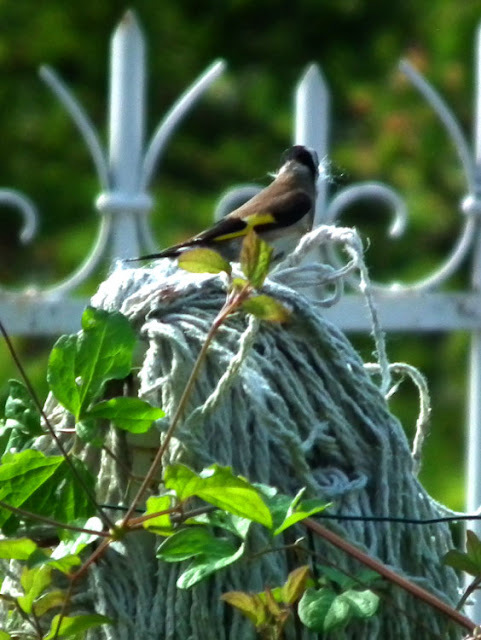 The flowers act as a cosy resting place and insects often spend the night tucked up in them. When they emerge, with any luck, they have an orchid pollenia stuck to their back and will transport it to the next plant for cross-fertilisation. The flower colour can be quite variable, so here is a rather dark tongued specimen. The former kaolin pit, now filled with water and very deep. It is L-shaped and bends away to the left beyond the edges of the photo. 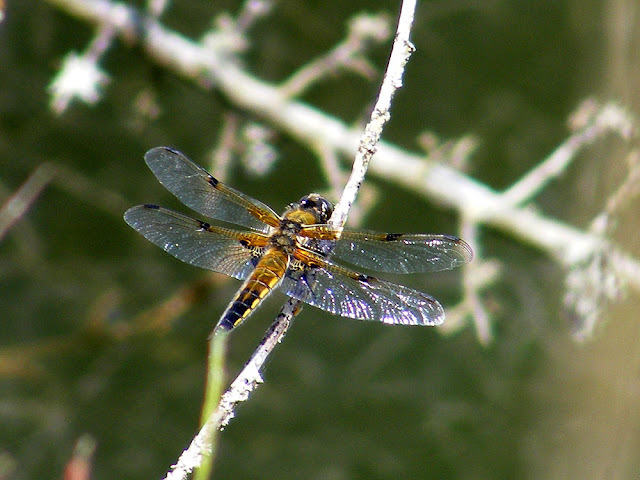 Four-spotted Chaser Libellula quadrimaculata (Fr. Libellule à quartre taches), staking its claim to one end of the kaolin pit. 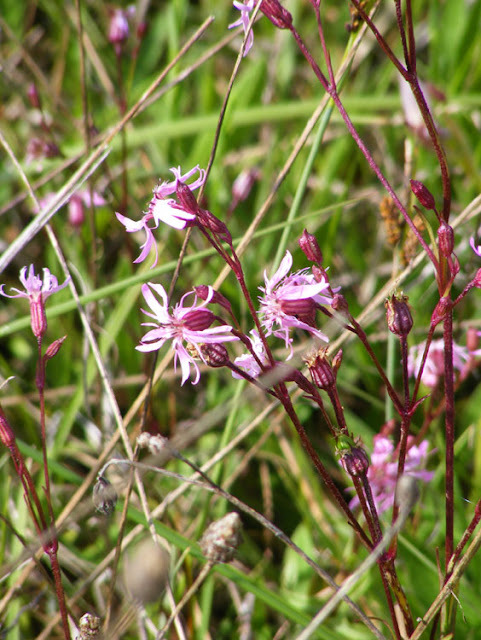 Ragged Robin Lychnis flos-cuculi (Fr. Silène fleur de coucou), another lover of wet grasslands. 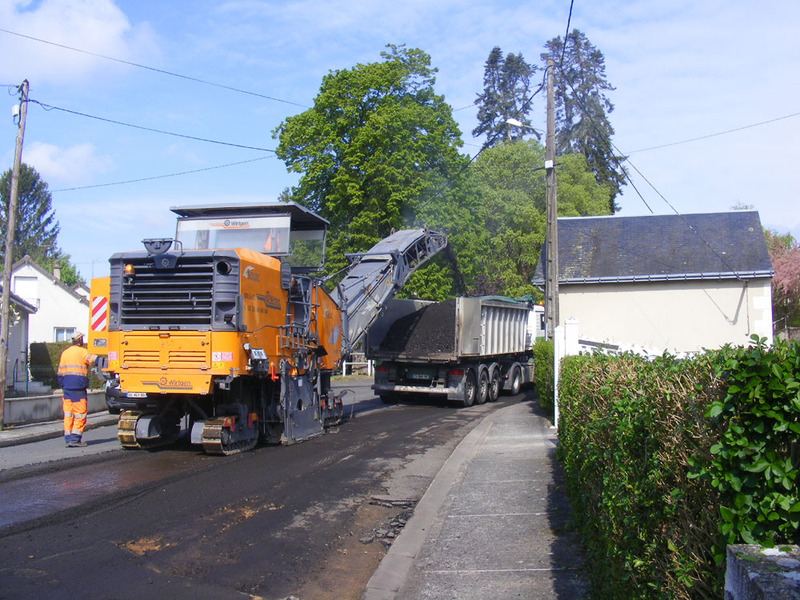 Ten days ago the road out of Preuilly in the direction of Le Grand Pressigny was resurfaced over a period of two days. The work blocked off the end of our street. At one point I went out to the supermarket and when I came back discovered that there was no way of 'legally' getting into our street. So I came down the street the wrong way. The big orange machine shaved off the old surface and spat it into the truck. 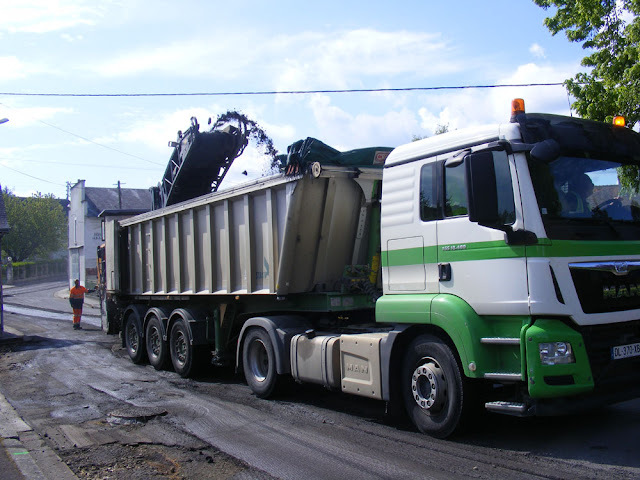 The driver bipped the horn whenever he needed the truck to move on, then bipped his horn again to say he'd moved up sufficiently. This went on all morning. On Thursday 4 May our walking club did a circuit from Buxeuil to Saint-Rémy sur Creuse and back again. It took us along the river, through the village, past troglodyte caves in the limestone cliffs and a medieval church and tower, up through the forest and down through the fields, back to where we started. 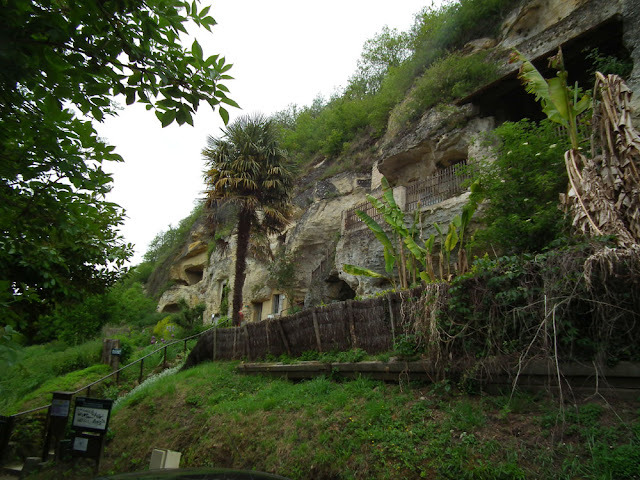 The troglodyte village of Ethni'Cité. Nestled in the cliffs overlooking Saint Rémy-sur-Creuse in the Vienne is a medieval troglodyte weavers village. 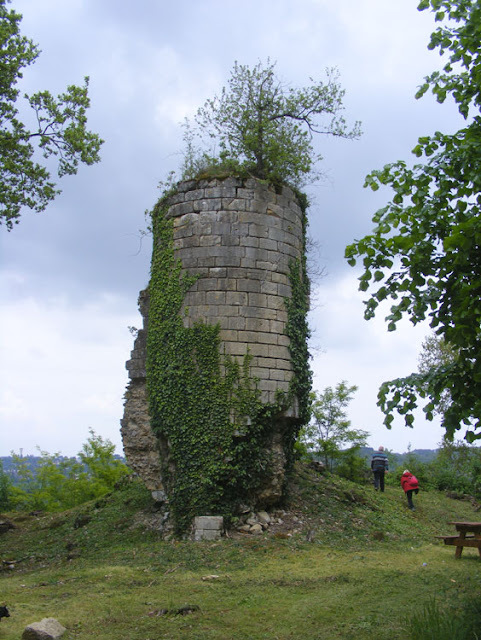 This ruined tower is the only vestige of a castle built by Richard the Lionheart, Duke of Aquitaine and future King of England. 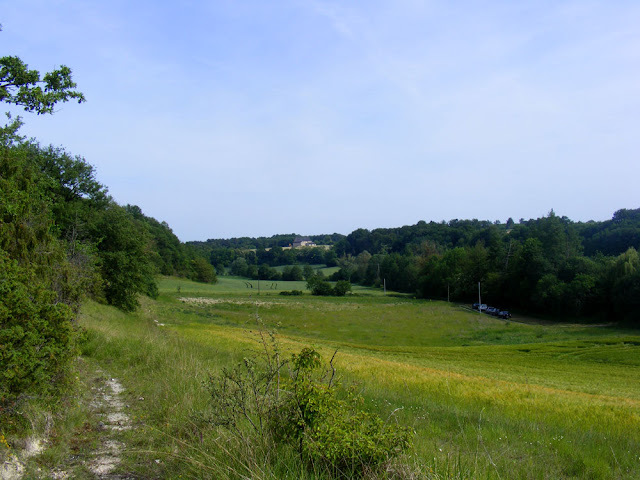 He acquired the land, which overlooks the Creuse Valley, from the abbey of Maillezais in the Vendée. The castle was destroyed in 1204 by neighbouring Tourangeaux forces, allies of the French King Philippe Auguste. Judging by the cadastral maps, the three other towers and the walls which formed the keep were still standing in 1831. Unusual carved stone window grill. 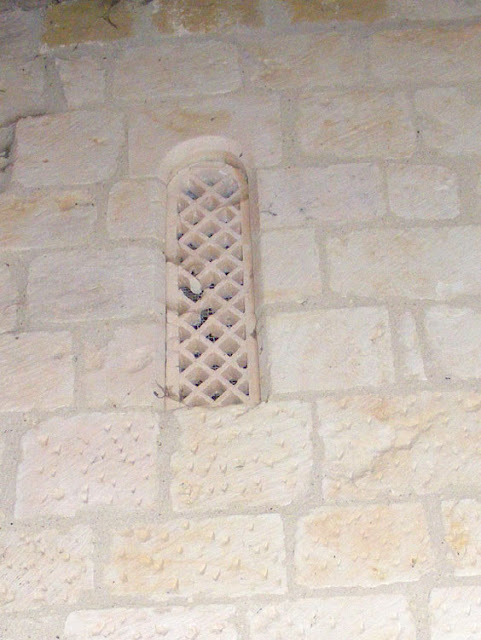 The window in the nearby 11-12th century church features a stone lattice in one of the windows. 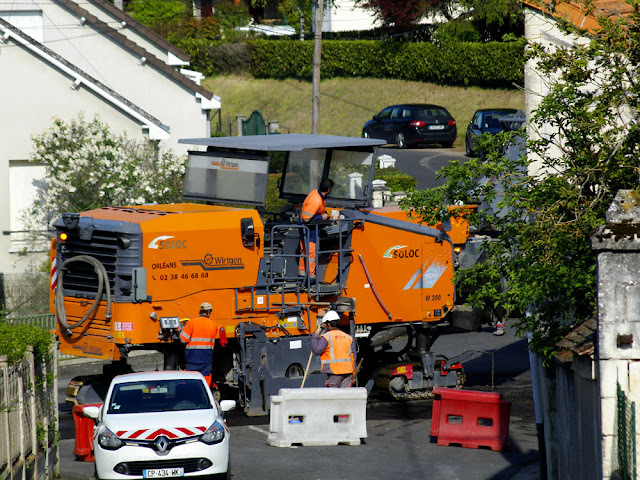 This is an unusual technique to see in France, being more common in Spain. Pollen accumulating around the edge of a puddle on a farm track. 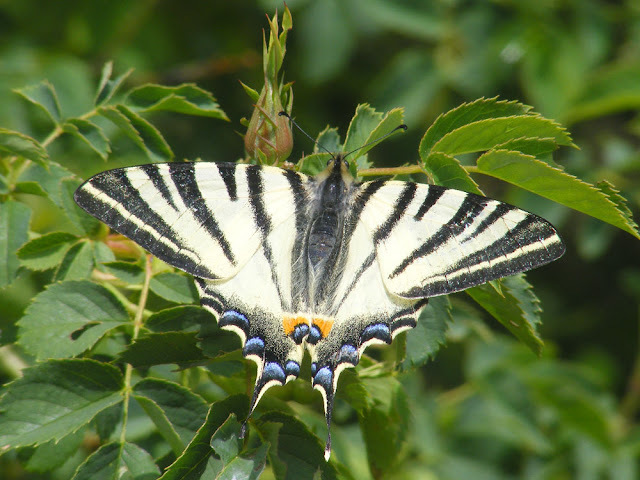 This beautiful fresh Scarce Swallowtail Iphiclides podilirius (Fr. Flambé) rests on a wild rose by the side of the track. 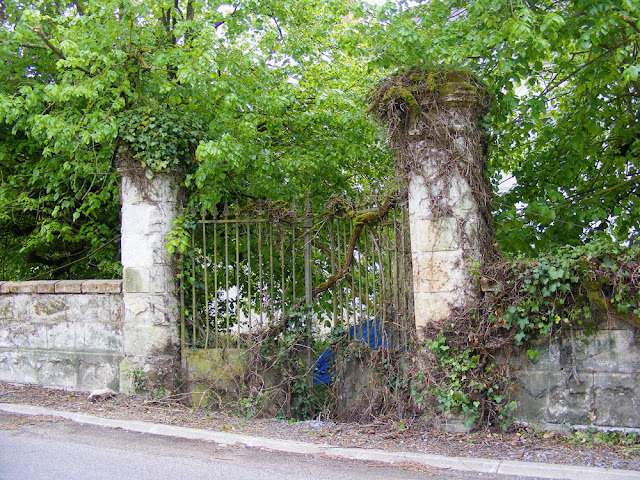 I thought this overgrown gate we passed had a touch of the Miss Haversham's house about it. 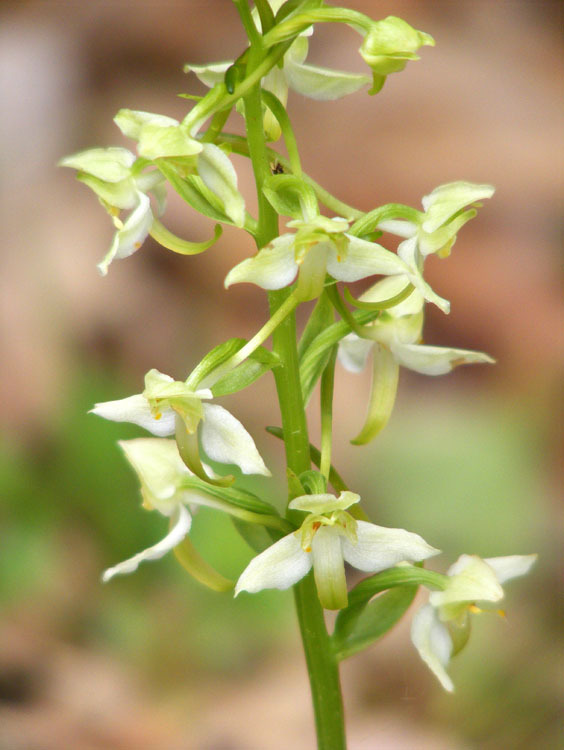 Greater Butterfly Orchid Platanthera chlorantha (Fr. Platanthère verte) were just coming into flower. 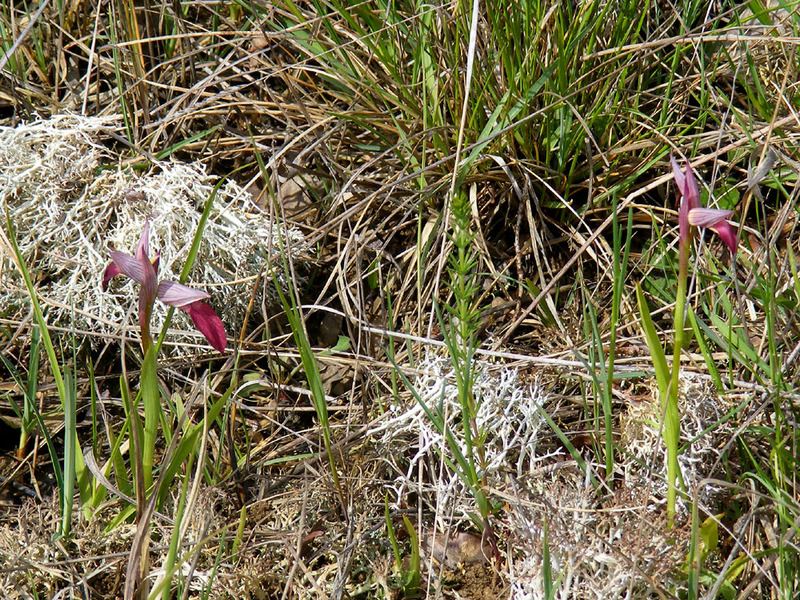 Four other orchid species were spotted -- Lady Orchid Orchis purpurea (Fr. Orchis pourpre), Early Purple Orchid Orchis mascula (Fr. 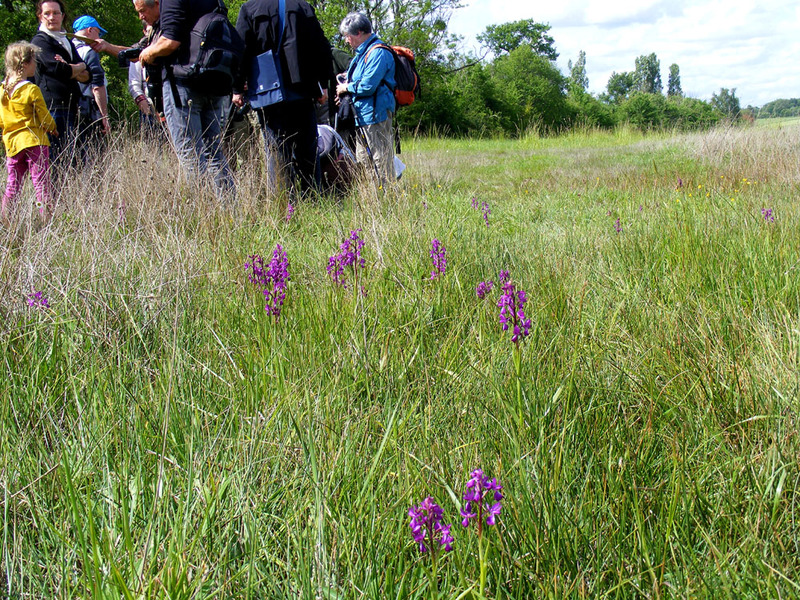 Orchis mâle), Green-winged Orchid Anacamptis morio (Fr. Orchis bouffon) and Lizard Orchid Himantoglossum hircinum (Fr. Orchis bouc). Much hilarity when I explained exactly why the orchis mâle is called that. If you want to know, read the link. Walking back down into Buxeuil. 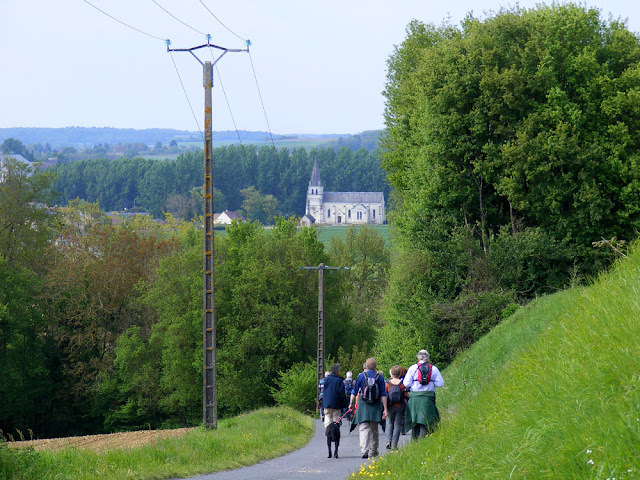 For another perspective on the walk see Jim's blog post on Loire Valley Experiences. Is This The Best View of Amboise Chateau? Drought or Flood in May?